Perennial. Rhizomes absent (1), or short (5); pachymorph (5/5). Culms erect (5), or geniculately ascending (1); 8-49.33-120 cm long. Lateral branches lacking, or sparse (4). Branch complement one (4/4); solitary (4/4). Culm-sheaths persistent (1/1). Leaf-sheath auricles absent (5), or erect (1). Ligule an eciliate membrane (4), or a ciliolate membrane (2). 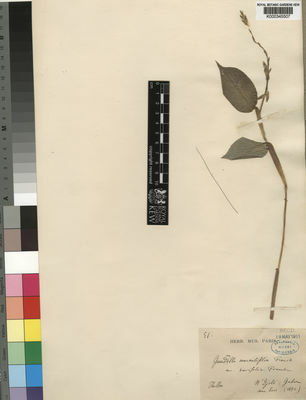 Leaf-blade base with a brief petiole-like connection to sheath. 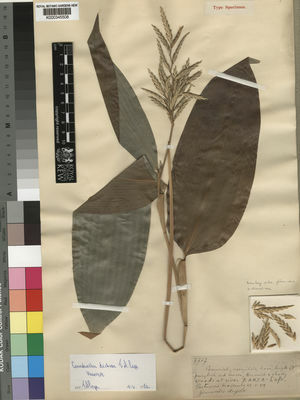 Leaf-blades elliptic (5), or oblong. Leaf-blade venation with obscure cross veins (1), or with distinct cross veins (5). Synflorescence on the same culm as leaves (4), or on a separate leafless culm (2). Inflorescence a panicle (4), or composed of racemes (2), or comprising only a few spikelets (1). Panicle open (1/3), or contracted (2/3). 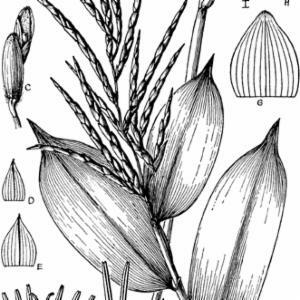 Racemes single (2/2); bilateral (1/1); bearing few fertile spikelets (1/2), or many spikelets (1/2). Spikelet packing broadside to rhachis (1/1); contiguous (1/2), or distant (1/2). Spikelets solitary. Fertile spikelets pedicelled. Spikelets comprising 2-3 basal sterile florets (1/1); 4 fertile florets (2), or 5 fertile florets (3), or 6 fertile florets (4), or 7-12 fertile florets (5), or 13-14 fertile florets (3), or 15-25 fertile florets (1); with diminished florets at the apex (5/5). Spikelets linear (3), or lanceolate (2), or elliptic (2), or ovate (1); laterally compressed; 10-35.83-120 mm long; breaking up at maturity; disarticulating below each fertile floret. Floret callus brief (2), or evident (3), or elongated (1). Glumes persistent; shorter than spikelet. 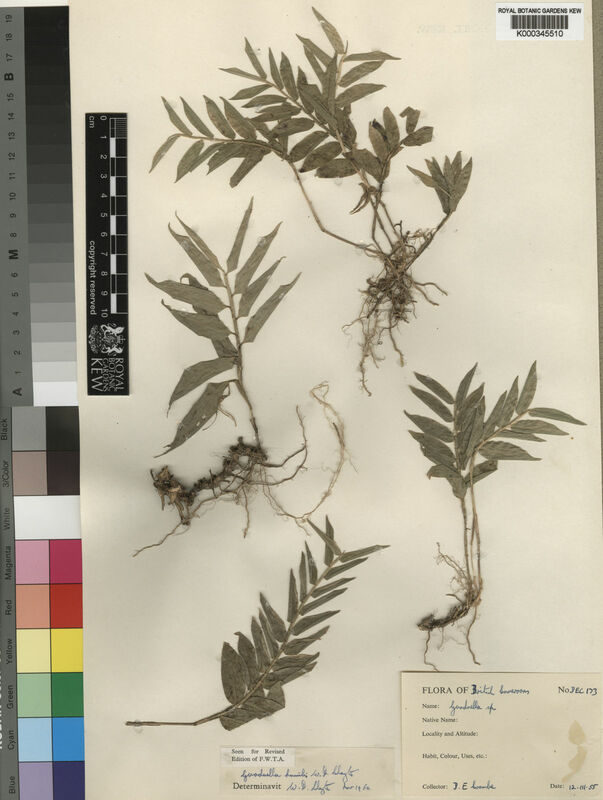 Lower glume lanceolate (1), or ovate (5); 0.4-0.7008-1 length of upper glume; herbaceous; without keels; 3 -veined (1/5), or 5-6 -veined (2/5), or 7 -veined (3/5), or 8-9 -veined (1/5), or 11-13 -veined (1/5). Lower glume surface glabrous (4), or puberulous (1), or pubescent (2). Lower glume apex obtuse (1), or acute (5). 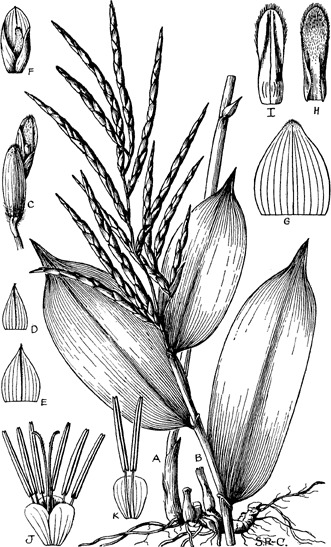 Upper glume ovate; 0.4-0.71-1 length of adjacent fertile lemma; herbaceous; without keels; 5-7 -veined (2/5), or 8 -veined (1/5), or 9 -veined (2/5), or 11 -veined (2/5), or 12-13 -veined (1/5). Upper glume surface glabrous (5), or pubescent (2). Upper glume apex obtuse (1), or acute (5); muticous (5), or mucronate (1). Basal sterile florets barren (1/1); without significant palea (1/1). Fertile lemma ovate (3), or obovate (3); herbaceous; without keel; 7 -veined (1), or 11 -veined (3), or 13-15 -veined (2), or 16-21 -veined (1). Lemma surface smooth (5), or scaberulous (1); puberulous (2), or pubescent (3), or pilose (1). Lemma margins eciliate (2), or ciliolate (4). Lemma apex obtuse (4), or acute (2); without ornament (5), or pubescent (1). Palea 0.75-0.99-1.2 length of lemma; 3 -veined (1), or 4 -veined (4), or 6 -veined (2). Palea keels winged; ciliolate. Palea surface glabrous (4), or pubescent (1), or pilose (1). Apical sterile florets resembling fertile though underdeveloped (5/5). Lodicules 2 (1), or 3 (5); membranous; truncate (1), or obtuse (5). Anthers 6. Stigmas 2; papillose. Ovary pubescent all over (1/1). Clayton in Kew Bull. 16: 247 (1962).